There are many kinds and types of cardiac-disorders. Many are right from birth and some due to external factors such as physique, diet-intake and so on. “Heart hole” is one of them. As the name indicates, there should be surely any major; minor hole, wound in cardiac-system.but it is not so as the name it spells. The description of heart hole is as follows. Ans.- heart holes are one of the congenital cardiac-disorder. This defect talks about the defective structure of the heart that are present at birth. This defect majorly affects the circulatory system i.e., changes the normal flow of blood through the heart. As we all know, in mammals’ and birds’ heart consists of four chambers. Those are divided into two sequences by a inner soft muscular membrane wall called ”septa” or “septum”. 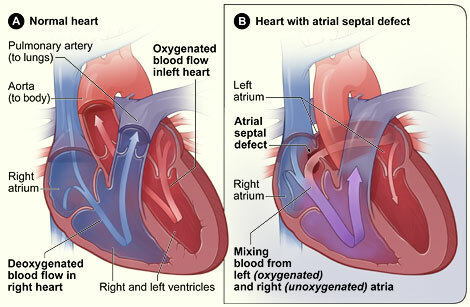 There is a very major function of septa/septum as these septa not only act as a wall between atrium and ventricles. But with each beat or pump the left side gets oxygen-rich blood and the right-side gets oxygen-poor blood. When there is a hole in septa the both variation blood i.e., oxygen rich and oxygen poor blood gets mixed together and as a consequence some of the oxygenated blood gets pumped into lungs instead of body. 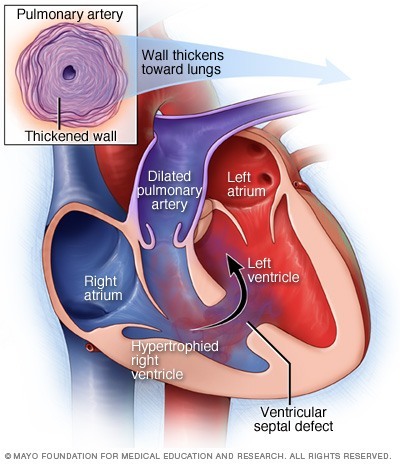 In heart, when there is a hole present in septa on the upper two chambers, then it is called ‘Atrial Septal Defect (ASD) whereas if there is hole in the two lower chambers then it is called ‘Ventricular Septal Defect (VSD). In early stage, this defect can be treated without any chances of risks, many babies treated can even survive to adulthood but if it is not diagnosed in early childhood this can be fatal. Swelling in abdomen, neck veins, feet and ankles. Whereas in the case of VSD’s , the sign heart grouching(common in both ASD’s and VSD’s) is usual. In VSD’s the unusual sound is present right from the birth. But in infants, these grouches can’t be heard until the baby is 6-8 years old. In babies, the medium and the large VSD’s leads to heart failure. As similar to the ASD’s ; VSD’s also possess the same symptoms but VSD’s symptoms occur right from the infancy. In VSD’s the sign and symptoms becomes rare after infancy as either the defect gets decreased or itself repaired. Doctors generally diagnose holes through several physical tests. In ASD’s the findings are generally unobvious but in VSD’s it is diagnosed during the infancy. Those doctors specialized in cardio forms of defects are called Cardiologists. Paediatric doctors specialize in treating children with heart diseases and surgeons repairs heart defects through surgery. First and foremost, in the physical exam the doctors uses stethoscope to listen the heart and lungs. It will provide them the convenience to check the grouching (unusual beats) or heart failure signs. Doctors also recommend a diagnosis test that helps them to figure out the location and size of the hole. One more diagnosis process that is based on ‘echo-beams’ called ‘echocardiography’. It is one of the painless methods that use sound moving waves to figure out the moving pictures of heart. These echo beams helps the cardiologists to find out any defect on heart surroundings and its working way. This test is very important in the cases of holes even some other defects too. It makes easy to get the idea of the heart and its reaction to the problems. Another test also known as ‘Pulse Oximetry’ is related to oxygen in the blood. In this a small sensor is attached to the ear or finger, this lets the light to appraise the amount of oxygen present in the blood. Chest X-ray is also a method; it is also a painless one. This creates a picture of heart, lungs and blood vessels. It helps to find out whether the size of heart is enlarged; it also plays a significant role in observing whether the lungs have extra blood flow or some other fluid that is the sign of heart failure. Last process called ‘Cardiac Catheterization’. In this process, a thin flexible tube called catheter is put into the vein of arm, groin or neck and it is threaded to heart. A special dye is injected into the blood vessels or one of the chambers of heart. This dye allows the doctors to check out the rate of blood flow through the heart in a X-ray image. The doctors also use this procedure to measure the pressure inside the heart chambers and vessels. It also helps to figure out whether the blood-mixing is occurring between the sides of heart. After these procedures done, the defect becomes clarified and one becomes sure what kind of, size of and dangerous the defect is. As soon as possible, treatment should be in action so that the defect must not proceed. Many holes does not needs treatment, with the passage of time they gets repaired itself. There is no possible answer to the question, why some holes needs treatment and some not. The treatment that a child receives depends upon the type, location and size of the hole. Other factors include are general health, child’s age etc. If a child has ASD , then routine-wise checkups are done. About half of all ASD’s are closed in their own time. In most of the cases, no more frequent checkups are needed. If still the ASD’s exists and is not naturally cured then doctors applies the methods of catheter or surgery. Earlier, till 1990 only surgical process was there to close the heart hole. With the advancement in the field of medical science a new treatment came into existence that is known as catheter method. It is a very eligible method because it is performed in children. It is very successful rated as 9 out of 10. In the catheter procedure, firstly the child is given a medicine by which he/she gets a sleep and unable to feel any kind of pain. After that, a catheter(a thin, flexible tube) is inserted by the doctors into the vein of the Groin(upper thigh). He or she threads the tube to the heart’s septum. With the catheter a device like disks or umbrella shaped discs is joined. When catheter reaches to the septum the device is pushed into it and placed in the place of hole and atria. It is secured there and the catheter is withdrawn from the body. It takes about 6 months for the growth of normal tissue into it; the closure device is not needed to be replaced. Catheter process is very easy just needs a needle injected. After the wholesome process there is no major leakage. Rarely if the defect is too large, then a surgery is needed. Generally, a open- heart surgery is done to repair primum or sinus venosus ASD’s. As catheter method, in surgery also a medicine is given to the child by which he/she will be slept and not feel any pain. The surgeon makes a incision (cut) on the chest of the child. A special patch is used to cover the hole. A heart-lung bypass machine is used in order to open the heart. The machine takes the action of heart pumping and removes the blood from heart. The outlook of surgery in ASD’s is excellent. The complications of bleeding and infections are rare. In some children, the lining of the heart is inflamed. The doctors call this as pericarditis. In hospitals, after surgery the child is given such types of medicines to reduce their anxiety or pain. In VSD’s, those children are monitored who are regularly in checkup and their symptoms does not persists to heart failure. Almost half of the VSD’s gets eventually closed or gets cured naturally. But checkups are compulsory as they let the doctors to know the exact and definite condition of the hole. In VSD extra nutrition or surgery becomes the option. But doctors also use catheter process if surgery is not possible. During the stage of infancy, the VSD’s children are recommended for extra supplements. The feedings should include high-calorie foods and the best in breast feeding that provides them higher nourishment. In some infants, tube feeding is also needed. A small tube is inserted into the mouth and directly passed down to the stomach, and by that tube food is given to the babies. Those Children who needs tube feeding, in just a short interval of time they requires surgery. Mostly doctors recommend surgical procedure to close the large VSD’s. And likewise the surgery is done on the first year old kids. Open-heart surgery can also be performed if needed. In this way, we have concluded that ‘Heart Hole’ is a dreadful disease if not detected in earlier stages. Normally we can see that many persons specially in rural areas dies because of heart attacks, lungs congestion etc. But does the reason is always the exact? No. In many cases reason is not as everyone thinks. As we read earlier, the symptoms begin to extinct after the age of 1-2. After that, it can neither be diagnosed nor be treated. So it is also a form of general awareness that parents should be always conscious for each and every form of checkups. One single careless step can deplete yours children’s life….. It depends upon the size and the severity of the heart hole. You can better try to get the natural remedy at Patanjali yogpeeth, Haridwar. You can carry all the previous diagnostic reports and scans for a convenient treatment. a woman of 40 years having hole in heart, cant afford to medical treatment. is there any food or yoga or anything which could help her to close hole in her heart? Well, it depends upon the severity and hole size. I will post a similar article on heart hole which will be dealing with natural treatment, which can be affordable even. You should try some cardiac exercises as well. Have u posted an article on natural treatment for heart hole….pls do so. Hello,am just reading ur post for the first time and I think its nice. Am from Nigeria and I knw an 8 yrs old gal hu has a hole in the heart resulting from her having fluid in her heart from birth. That has been flushed out.So pls cud u recommended d natural herbs and exercises to help heal d hole because her family cannot afford surgery. Tnx. 15 days baby boy detected with VSD 5mm hole, what u suggest. It is not good to hear, an infant suffering from such problem. Well, it is fortunate thing that diagnosis has been cleared, thus for further treatment. You consult a cardiologist with pediatrician suggestion. One can also try with natural medicines and Ayurveda. My daughter who is 6 years old was detected with VSD 6mm hole at time of birth. Doctor recommeended medications to treat it. Now at age of 6 her hole is 3mm. How much time it will take to close the hole. Is there any ayurveda treatment available to recover fast. Is there any special diet for my daughter to recover early. 18 years old boy with large vsd …how to cure hole naturally or without surgery ? ?plz ans..
My baby is 2 months and she detected VDS, is there any natural food or way we can minimise the hole without surgery?does Ayurveda has any solution? 24yrs old boy, diagnosed with vsd with 17mm i.e. 1.7cm hole . Can you suggest nutritions and follow up for him. And can surgery cure this 100%? He was advised for surgery but not sure whether it may end up successfully. So with hesitation I am rising this question hoping for a satisfactory reply. How can person of 63 years old be treated with a hole in heart, diagnosed couple of years ago? So sorry to hear about your daughter. I will post an article soon on the natural treatment for heart hole. Although it’s one of the severe cardiac problem. If the size of hole is small, then it can be cured with natural cure itself. But if it is larger then it will need some surgeries or some medication itself. At first consult the physician and get to know about the treatment. So sorry to heat that. Although you are an adult now and home remedies and Ayurvedic practices will work very minimal. You better consult the cardiologist and ask about the treatment procedure.